Mary Kroner’s roots may run deep downtown, but the soft-spoken, 28-year Northside resident is most animated when the conversation turns closer to home. Kroner is the coproprietor of Ruth’s Parkside Café, located in the recently renovated American Can Building on Spring Grove Avenue. Along with her longtime friend and fellow Northsider, David Tape, the pair have attempted to re-create a small piece of Cincinnati’s casual dining history. Ruth’s is the spiritual successor of Mullane’s Parkside Café, the former Race Street establishment near Garfield Place where many Cincinnatians had their first bites of tempeh and tofu. Ruth Cummings was Mullane’s kind-hearted bookkeeper who bequeathed Tape the seed money for her namesake business; he and Kroner met Ruth’s current chef, Kevin Worthington, during the café’s heyday in the early ’90s. Tape hired the 21-year-old to wash dishes and Worthington proved indispensable, moving up to prep cook and finally sous chef. A tenacious friendship developed among the three principals that would eventually outlast Mullane’s itself. The energy in the dining room at their new place is palpable, a vivid contrast to the more austere, industrial apartments that now occupy most of the building. The seating area makes full use of the floor-to-ceiling windows; a warm, earth-toned color palette of ochre, golden yellow, and terra cotta lends a cozy vibe; and the exposed ceiling feels highly theatrical. Which is apropos. Artist Jay Bolotin, a former Mullane’s regular, used the building’s ground floor as a production studio for his Mechanical Opera 20 years ago, a performance art piece whereby actors shared a stage with grotesque sculptures. One such piece, a devilish mechanical construct combining pig and human features, hangs over the bar, looking down on Kroner and Tape as they greet familiar faces and dish the neighborhood dirt. It’s apparent that the conviviality of community is the common denominator; Ruth’s succeeds Mullane’s like an open-growth lettuce, secure in its roots and primed for its second harvest. Mullane’s vegetable-forward menu was visionary 30 years ago, and Worthington made only minor changes when the three opened Ruth’s this past summer. 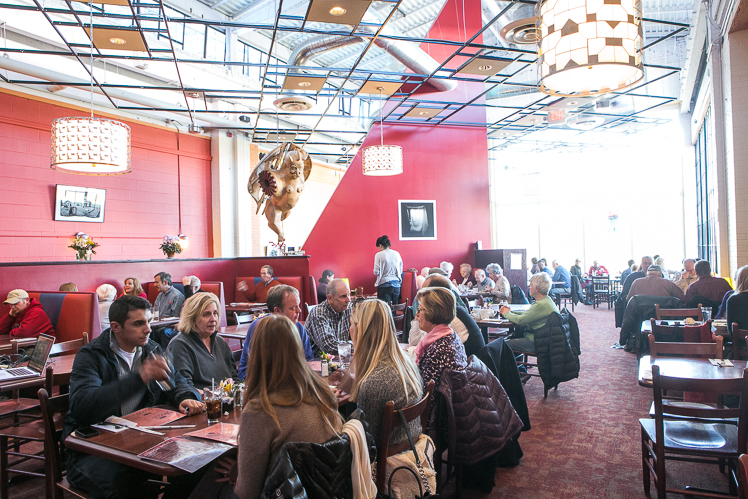 Concessions to contemporary tastes manage to feel consistent with the restaurant’s bohemian vibe. Dinner options now include steaks and heavier, braised entrées. But the stir-fries, beans and rice, pasta, and the traditional option to add a protein to an entrée (tofu, tempeh, chicken, or local chorizo) for a $2 upcharge are all old standards. Between the nostalgia and bonhomie, it’s easy to overlook one of Ruth’s greatest strengths: Worthington’s skill at maximizing the flavor potential of humble ingredients. The Yvonne is a classic example. A Mullane’s staple named for a friend of founder Kim Cole, the open-faced sautéed vegetable sandwich layers lightly caramelized onions, broccoli, mushrooms, zucchini, spinach, and tomato, with a single slice of Swiss cheese. The bread is crisp, the vegetables lightly browned and the cheese still soft. It is a humble study in technique and attention to detail. Ruth’s daily rotating soups don’t get short shrift either. The kale, ham, and white bean soup is initially mild, but the bitter green adds pizazz and counteracts the saltiness of the pork. The seafood gumbo, chockablock with roughly chopped okra, has depth and a lingering cayenne heat that adds much-needed brightness to the stew. Even in dishes featuring a large ensemble cast, flavors mingle but rarely muddle. The Orange Szechuan stir-fry is pleasantly bold, with crunchy shards of carrot, cabbage, and greens jostling for lashes of a piquant, faintly citrusy brown sauce. The tofu, supple and rich, hangs on to just enough sauce to keep the mild heat consistent. 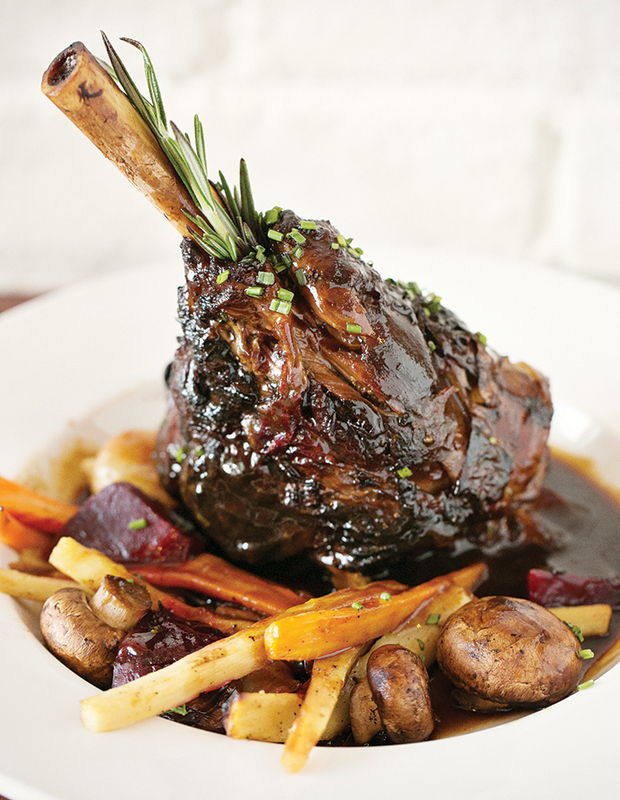 Meat-eaters will enjoy the port-braised lamb shank. Flinstone-like in its girth and presentation, the bone-in shank is definitely dramatic. The syrupy-sweet, almost lacquered exterior gives way to shockingly tender meat, and the accompanying carrots, onions, and mushrooms are cooked to tender perfection. While much of Worthington’s menu succeeds, there are a few misses, particularly on the sandwich portion of the menu. The burger, a well-seasoned chuck patty, feels dense and over-handled. The tempeh in the Tempeh Reuben is overshadowed by weepy sauerkraut and an overabundance of Russian dressing, leaving the bun saturated and unappetizing. While dishes are generally hearty, they are rarely too rich, leaving room to freely consider dessert. There are a small selection of baked goods, including a chocolate bundt cake, homemade fruit pies, and Madisono’s Gelato. I especially enjoyed the Butter Cake—basically a dense cookie crust supporting a layer of intensely buttery custard. It was somewhat reminiscent of a chess pie, where butter, eggs, and sugar are heated just enough to set. It’s the creation of Kathy Robbing, known to many as The Flying Baker. Ruth’s wine list is predominantly New World; glass pours are priced at $5 to $8 and most bottles hover around $25. Carnivor, a jammy northern California cabernet, pairs well with much of the menu. A small craft beer selection—including a few Ohio brews (MadTree’s Gnarly Brown ale, Fat Head IPA from Cleveland)—is available by the bottle and on tap. It’s the cumulative experience of the old Mullane’s trio—not to mention a healthy dose of passion—that has brought their parkside café reboot to life. But Ruth’s success will depend on its ability to pay homage to the past while finding fresh ways to flirt with the future. Hours: Lunch and dinner, Mon–Fri. Dinner Sat 5–11. Much of the old Mullane’s crew reunites at this cozy Northside café. Soups are hearty, meatless dishes are flavorful, but some sandwiches are hit or miss. Save room for dessert—the humbly billed Butter Cake was the real stunner.